Home Blog	FOOD TRIPPIN’: ON AIR with Zane Caplansky and Fall/Winter Activities in Toronto! FOOD TRIPPIN’: ON AIR with Zane Caplansky and Fall/Winter Activities in Toronto! Recently my friend Chef Zane Caplansky and I spoke about my culinary journey and he loved my story. He invited me to hit the airwaves with him on his hit Toronto radio program “Let’s Eat” on NEWSTALK 1010. There was no way I would pass up on this great opportunity to share my passion and hard work with his listeners. A date in sight, and having enjoyed Toronto in the Fall before, I knew I would plan a little getaway in the city. As the temperatures have started dropping, there was no doubt in my mind that I preferred to fly than to drive. I browsed the web and discovered Porter Escapes. As you all know, my favourite airline by far is Porter. Service is always on point, a club lounge in Ottawa and the convenience of landing Downtown Toronto are key. I dug a little deeper in the Porter Escapes site and I loved the fact that I could book my Porter flight along with many partner hotels – all in one spot. Having stayed many times, I quickly opted for the Chelsea Hotel. My family and I have stayed there numerous times. It has great proximity to the Eaton Centre and I love staying in the heart of downtown. It is such a great family hotel, but the hotel with the most rooms in Canada also offers some luxuries for adult travellers. Yes – I’m talking about Club Life! An upgrade to the Club Floor is a great option. Hot breakfast, evening hors d’oeuvres, drinks and snacks 24 hours a day are awesome perks. I landed Friday morning at Billy Bishop, and within minutes I checked-in to the Chelsea. It was time to embark on a culinary tour. Tours are great activities as the weather cools down. With short walks between locations, you get to warm up and enjoy delicious food and drink. I headed over to the entrance of The Hockey Hall of Fame where I met my tour guide Mike. Toronto Urban Adventures offers a few tours – which were all of interest! I opted for the “Beer Makes History Better” tour because craft beer is something I really enjoy. Stops on the tour included C’est What Craft Beer, St. Lawrence Market, Betty’s on King, the historic Distillery District, and concluded at Mill Street Brewery. Being a foodie, their other tour “When Pig’s Fry” was also of interest, so the tour guide opted to share one of the experiences with everyone on the beer tour. A stop at Carousel Bakery in the St. Lawrence Market, home of the World Famous Peameal Bacon Sandwich. Mike was by far the most knowledgeable, entertaining and interesting tour guide by far – the others on the tour would agree. On a side note, the beautiful Distillery District is home to the Christmas Market that is now on until Sunday December 23, 2018. Back to the Chelsea to freshen-up and back to the Distillery District for dinner. Cluny Bistro was my choice for tonight. The French Bistro menu appealed to my eyes and, well, my belly. I opted to try several items from their Small Plate menu which included Tableside Beef Tartare, Urchin Toast & Roasted Bone Marrow with Escargot. All were very good, but I think the Tableside Beef Tartare could use some tweaking to engage the diner a little more, kind of like the Tableside Caesar Salad experience at Jacobs & Co. Steakhouse, which I’ll talk about in a bit. I had to opt for the Chocolate Soufflé to finish off my bistro experience and it was just as you would hope – light and delicious! I was off to bed in preparation for my radio interview Saturday morning. I woke up, got dressed and headed to the Club Lounge, located on the 27th floor of the Chelsea and enjoyed a cappuccino and hot breakfast to kick my day off right. I made my way to the old CHUM radio building to meet Zane. Only a few minutes later Zane and I took to the airwaves and discussed my culinary journey. What a great time I had on air. It was time for lunch – I made my way to one of the most renowned Japanese Restaurant brands in Canada, Miku Restaurant. From their Premium Sushi Plate, to fresh Uni from Boston, MA and a side of Toro & Wagyu Nigiri, one could say I enjoyed the best of the best – and that is no understatement! They are known for their Aburi Sushi, a nigiri style presentation that is flame seared as well as Oshi Sushi which is also known as pressed or box sushi. It was a beautiful meal – and it was so good. Sometimes my sweet tooth just takes over my judgement and when I heard there was a chocolate tour in Toronto, how could I not take a bite! Tasty Tours Toronto offers a couple amazing tour options including their Kensington Market Sweet & Savoury Food Tour and the one I opted for, Toronto’s Ultimate Chocolate Tour. Our stops included SOMA on King, Away Café, Sanko, Nadège Patisserie, Le Dolci and Odile Chocolat. And as the saying goes, saving the best for last was the case here too! Meeting Odile who has perfected her craft and learning all about chocolate and the reasons behind bitterness and texture was phenomenal. Her chocolate was also the best I’ve ever eaten. Our guide Christie was great at sharing her vast knowledge and experience of chocolate. At the end of the tour we were all given a parting a gift – a Toffle. The Toffle is the love child of a butter tart and a chocolate truffle, it features a triple layer of crumbly crust, silky chocolate ganache and gooey maple butter tart filling, all covered in chocolate. A quick jaunt to the hotel and then back out to King and Brandt for dinner at by far my favourite steakhouse, Jacobs & Co.
Having their own dry-aged beef program in-house and one of the only restaurants in Canada licensed to sell real Kobe beef, there are cuts to please everyone’s palate. One of the coolest ways to kick off your meal is by far the Tableside Caesar Salad. Authentic caesar dressing made from scratch in a large wooden bowl as the server emulsifies the olive oil and egg yolk. They also offer a play-by-play of what they are doing – making for a very interactive experience. The white anchovies are special – so why not. The caesar is a must! My main was a beautiful 65 day in-house dry-aged rib-eye steak from Creekstone Farms from Arkansas City, KS with a side of roasted bone marrow and seasonal delicata squash. To be honest – once you’ve had a Jacobs steak, the bar will be raised, and you will start judging every other steak you will ever eat against their phenomenal cuts. If you haven’t been – please go and tell Robert & Chef Danny I sent you! It was about time to turn in for the night. I took Sunday morning easy as my Porter Escape at the Chelsea was wrapping up. But before I could head to Billy Bishop, I had to stop in to Bar Buca on Portland St. for brunch. This is a hotspot for beautiful and tasty food like Nonna used to make. I opted to upgrade my latte to buffalo milk and ordered the “al forno”. Baked eggs, buffalo ricotta and pesto Genovese. I also ordered a fennel sausage on the side. I didn’t have the chance to catch up with Chef Rob Gentile this time as he was busy setting up his 100 Eglinton Ave E. location of Bar Buca that is now open. I tell it like it is – and I have to share that both Jacobs and Buca are part of the King Street Food Company and this is quite the powerhouse. Joining the two of them are Jamie’s Italian, La Banane and CXBO Chocolates. I hailed a cab and took the short ride to the island airport. I always think to myself, imagine if I had to go all the way out to Pearson – it would add so much time to a trip. 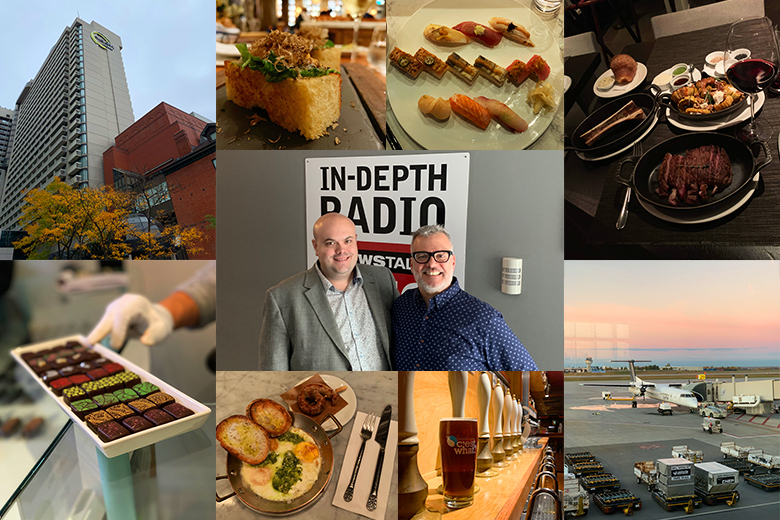 After checking-in, I got to experience the newly opened lounge at Billy Bishop which features Balzac’s Coffee Roasters, Obispo Tapas Bar and the Toronto Island Market. With new seating options and a more open concept, the lounge feels really upscale. My flight was called, and I boarded the plane for Ottawa.